All the power of Palm webOS — including multitasking activity cards, Palm Synergy, intuitive notifications, and universal search — will soon be available in a striking new form factor. Palm Pixi — due on the Sprint network in time for the holidays — is Palm’s thinnest phone ever. With a visible full keyboard and rubberized back cover, Palm Pixi is especially handy for extensive messaging and social networking. Want to add a touch of extra style? The Palm Pixi Artist Series offers you a selection of limited-edition back covers in a range of eye-catching designs. You can find all the designs in the first Artist Series here, and you can find more details about Palm Pixi here. And here’s some good news about the older sibling in the family: You can now purchase a Palm Pre from Sprint for as low as $149.99 with contract. Palm Eos (Pixie) still on track for November? The Palm Eos was originally expected to launch in the US in the fourth quarter of 2009. Then we heard that it was delayed until 2010. Then another report said it was still planned for an October launch. Today, David Eller, the Townhall Investments Research analyst who expects Sprint (NYSE: S) to miss their Palm Pre sales targets for the current quarter, notes that the Palm Eos appears to still be on track for a November launch. 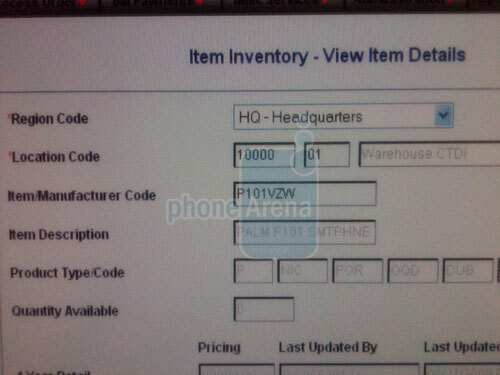 Phonearena released some data pics of Verizon’s inventory database. 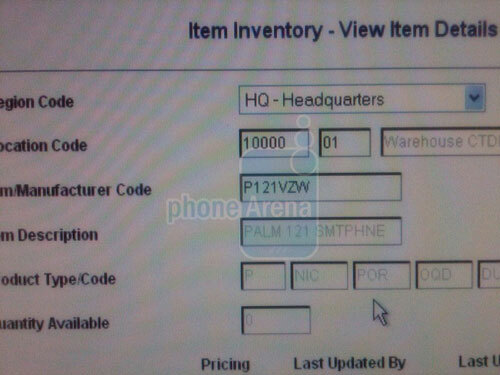 Two Palm devices, CodenamedP101 and P121, are there too — they are probably the Palm Pre and Palm EOS. Precentral reports that shipments of the Palm Eos to Palm are indeed set to begin in October, which increases the chances for a 2010 release. The Eos is rumored to be a slightly lower-end device running webOS, with 4 gigs of internal storage and a slightly smaller screen than the Pre.